The highest-ranking black officer on the Los Angeles police force was named the new chief of the San Francisco Police Department on Tuesday. San Francisco Mayor Ed Lee selected Los Angeles Police Deputy Chief William “Bill” Scott, who had overseen the LAPD’s South Bureau, to lead the troubled SFPD, the Los Angeles Times reports. 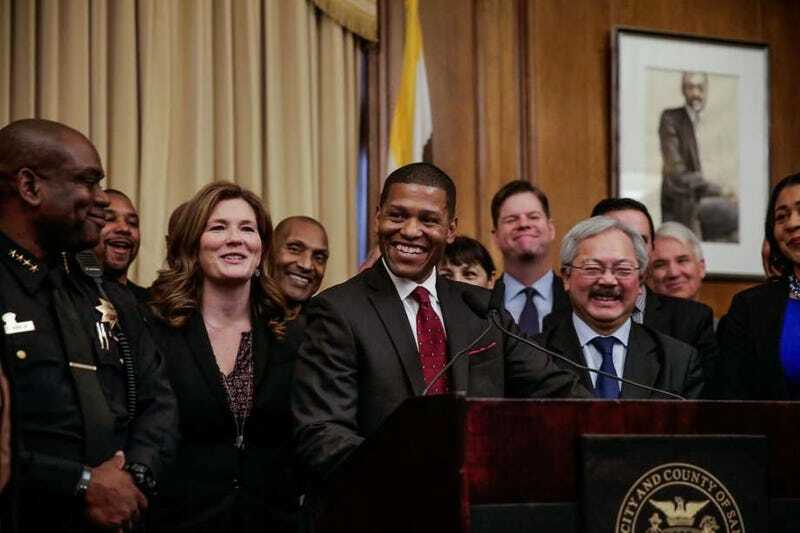 Scott’s appointment comes at a time when the SFPD has been struggling with its image. The department was heavily criticized after the fatal shooting of 26-year-old Mario Woods, a black man suspected of assault, who was shot by police 21 times while holding a knife. Following the shooting, a six-month investigation into the SFPD’s practices and policies by the U.S. Department of Justice found disparities in traffic stops, post-stop searches and use of deadly force against African Americans, as well as implicit and institutionalized bias against minority groups. More recently, the Police Department was the subject of a scandal involving racist text messages being sent among officers on the force. At the news conference where Lee made the announcement, he noted that Scott, 52, with a career spanning 27 years, has the experience to get the job done and help reform the SFPD. “Deputy Chief Scott has seen firsthand not just what it takes to implement a series of reforms but the efforts it will take to transform a department … to build trust,” Lee said. Scott, who promised to be a “fair and consistent” leader in his new role, said that he was happy with his job at LAPD and wasn’t looking for a change when he got the call from a recruiting firm. He will be replacing acting Police Chief Toney Chaplin, a 26-year SFPD veteran. The Times reports that Scott was one of three names given to Lee by the San Francisco Police Commission, while the San Francisco Police Officers Association had pushed for Chaplin’s appointment. Lee praised Chaplin, saying that he had laid the groundwork for the department to be reformed, and the police officers union issued a statement saying that the association looked forward to working with Scott. According to the Times, Scott joined the LAPD in 1989 and worked his way up the ranks. He is a U.S. Army brat whose family settled in Birmingham, Ala., and he attended the University of Alabama. Scott is an advocate of community policing, and he believes that policing has changed dramatically for the better since his rookie days. He said that officers need to think of themselves as guardians watching over communities and not warriors cracking down on them.